PHP is considered as the most powerful computer language that makes things happen with the glimpse of seconds. However, PHP is not supported by Blogger or BlogSpot running platform which makes it extremely difficult to customize and implement some new latest developments, but there are still some ways through which you can add PHP codes in your Blogger enabled Website. Though, the results are not 100%, but it is far better than not having a PHP code on your blogger site. 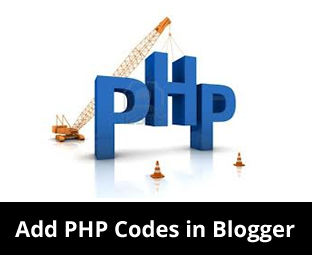 In this article, we will show you how to add PHP codes in Blogger. After creating the file with all your desired codes make sure you save it in .PHP extension. For example, mybloggerlab.php, you can use NotePad++ for writing codes because it is the only FREE standard developing tool. Since, blogger does not allow you to host any kind of files like PHP, HTML or CSS. Therefore, you have to either host it on your hosting (if you have) or you can use Google Drive to host them for FREE. We have already written a detailed tutorial on It, so read it here. You can also use Dropbox, and many other free hosting services but certainly they are not better than the features and reliability of Google Drive. After creating and hosting the PHP file, login into your Blogger account. Once logged in, head over to the dashboard and select the blog on which you would like to add PHP Codes. Now it depends on your needs whether you want to add the PHP code in posts, pages, sidebar or footer. Just paste the following code anywhere you would like to display the PHP file. Don’t forget to replace your-file.php with the URL of your own PHP file that you may have got while hosting it on services like Google Drive Dropbox and etc. Congratulations: You have successfully added PHP codes to blogger. Go and check your blog to see if things are working as planned. Let us know, if you have a better way of doing this job. We hope this tutorial has helped you in learning how to add PHP codes in blogger. Still, this is not the most accurate way because we are just using a iFrame technique to include the codes. Blogger needs to think more on making its platform friendly for the developers so that they can bring awesomeness to their blogs and websites. wow dear its amazing, now we will be able to use php on blogger, but for that we use other hosting sites for upload php files. It's good to making contact form or other scripts. But still we have't access to database to make things dynamic. You're wrong, it should be PHP is the most powerful web language when it comes to computer it's C.
When i host this file in Google drive, the file is downloaded, it isn't executed. i'm very very like this post because is very helpful form e because i'm a designer and developers of blogger. but can i create a user or other dashbord like as wordpress, plz tell me?? Friend Nice Tutorial. I am injoy to read this article. Very nice post...Thanks for sharing this. That is why I like Mybloggerlab. The way you have explained is really quite amazing. Thanks for sharing such a great article with us. What about connection to MySQL? Good post for simple PHP. BUT - There is an issue with Google Drive. So, Google Drive is good for .js, .css, .jpg or whatever, but for PHP I'd recommend to use a free or paid PHP hosting. I want to add ajax php star rating system to my posts in this way. How to do it? If i want to run php script? how do i run it on blogger? Blogger does not allow saving of php file. Not sure how to proceed. "Don’t forget to replace your-file.php with the URL of your own PHP file that you may have got while hosting it on services like Google Drive Dropbox and etc." how to get the URL of the php file in the Google Drive? i performed all the steps to perform it but a message appear on screen "a plug in is required to play this content"